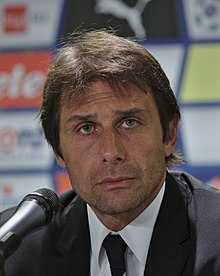 One of the famous Italian footballer and manager in the world is Antonio Conte. He is a professional footballer manager and an ex-football player. He used to play as a midfielder. He became one of the most influential and decorated personality as a player and later manager of the Juventus’ history. He started his professional football career from Italian club Lecce in 1985 before joining another Italian club Juventus in 1991. He was the captain of the team while he helped Juventus to win five Serie A, one Coppa Italia, four Supercoppa Italiana, one UEFA Champions League, one UEFA Cup, and one UEFA Intertoto Cup titles during his playing career. As a manager, he helped Juventus to win three Serie A and two Supercoppa Italiana titles. He has also managed Italian clubs, Arezzo, Bari, Atalanta, Sienna, and English club Chelsea, where he helped Bari to win Serie B and Chelsea to win Premier League and FA Cup. He played also Italian National team while he was the participant of 1994 FIFA World Cup and of 2000 UEFA European Championship. On the two occasions, Italians were runners-up. Individually, he has earned quite a number of achievements. For his managerial career, he was collected Panchina d'Argento, Panchina d'Oro, Serie A Coach of the Year, Globe Soccer Award for the Best Coach of the Year, Gazzetta Sports Awards Coach of the Year, London Football Awards for Manager of the Year, Premier League Manager of the Season, LMA Manager of the Year, and Special Achievement GQ Men of the Year Award. He is one of the most decorated personas in the football history of Juventus. He has won numerous titles there, both as a player and as a manager. He is known for his 3-5-2 formation as a manager. Antonio Conte was born on 31 July 1969. His birthplace is Lecce in Italy. He was born to Cosimino Conte and Ada Briamo. He has a brother named Gianluca Conte. He holds Italian nationality. He grew up in Lecce. He started his football career from a local club, Lecce. He is Catholic. Antonio Conte began his football career from the local club, Lecce. He became one of the key players in the team. He suffered tibia fracture in 1987, which almost ended his career as a player. However, he returned to the pitch after the recovery. He has only one goal in his account for Lecce. In 1991, Italian club Juventus signed Conte, and the rest is history. He proved himself as an important member of the squad that he was assigned the team's captain in 1996. Conte has made 295 appearances in Serie A with 29 goals, and 418 appearances with 43 goals in all competitions. He played 13 seasons and has won several titles while at Juventus. As a player, he has successfully won 5 Serie A, 1 Coppa Italia, 4 Supercoppa Italiana, 1 UEFA Champions League, 1 UEFA Cup, and 1 UEFA Intertoto Cup. Conte made his senior debut for Italy national team in May 1994. He was one of the key players in the Italian squad that finished runners-up in both 1994 FIFA World Cup and 2000 UEFA Euro Cup. As a player, Conte has made 20 competitive appearances and scored twice. Italian Football Federation appointed Conte as their manager in August 2014. Conte's Italy succeeded in defeating Norway 2-0 in their opening Euro 2016 qualifier in September 2014. It was Italy's first victory over Norway since 1937. Conte helped Italy to qualify for 2016 Euro. Conte resigned from the managerial duty following quarter-final exits from 2016 Euro, suffering penalty shoot-out loss against Germany. Conte started his managerial career as an assistant manager for Italian club Siena in 2005. In July 2006, he was appointed a manager of Serie B club Arezzo, where he was sacked from the club in October 2006, and reinstated his place in March 2007. In June 2007, Italian club Bari appointed Conte as the club's manager. Conte's first success as a manager came in 2008-09 season, where he helped his team to win Serie B and promote to Serie A for 2009-10 season. In September 2009, another Italian club Atalanta appointed Conte as their manager. Conte struggled at Atalanta. He resigned from the manager in January 2010 following the dissatisfaction from the club's supporter towards him. In May 2010, Siena appointed Conte as their new manager, where he helped the club to re-promote to 2011-12 Serie A season. In May 2011, Juventus appointed their favorite player Conte as their manager replacing Luigi Delneri. As a manager, Conte once again led Juventus to glorious history. He helped the club to win three consecutive Serie A titles from 2011-12 to 2013-2014. He also helped Juventus to win two Supercoppa Italiana in 2012 and 2013. In April 2016, English club Chelsea appointed Conte as their new manager. He became the first manager in the history to win three consecutive Premier League Manager of the Month Awards for the month of October, November, and December in 2016. During his two seasons as a manager at Chelsea, he helped his club to win 2016-17 Premier League and 2017-18 FA Cup. He was sacked by Chelsea in July 2018. Antonio Conte is married to Elisabetta Muscarello. They have a daughter together named Vittoria. The couple dated for fifteen years before they got married in 2013. Antonio Conte never gets tired to express his gratitude to the support he gets from his wife and daughter during the Scommessopoli match-fixing scandal investigations in 2011-12. Besides Italian, he can also speak English fluently. Antonio Conte has an estimated net worth of £10 million. At Chelsea, Conte earned 6.5 million pounds per season. He was sacked from club's managerial duty in July 2018. During his time as a player with Italian giants Juventus, he managed to win 5 Italian league titles, an Italian cup, UEFA Champions League and a UEFA Super Cup. As a player, he managed to finish as runner-up at the UEFA European Championship (2000) and FIFA World Cup (1994) with the Italian national team. For leading Juventus to 3 consecutive Italian league titles, he got honored with three consecutive Serie A coach of the year awards in 2012, 2013 and 2014. For his tremendous contributions to the Italian soccer as a player, he was honored with Cavaliere Ordine al Merito della Repubblica Italiana, which essentially is a 5th class knight. At the end of 2012-2013 season, his Juventus team created a history by becoming the first Italian top flight team to finish the league unbeaten since the league was expanded to include 20 teams. At the end of 2013-2014 season, Conte’s Juventus side created history by becoming the first Italian side to finish the season with 102 points. In January 2017, he made a record by becoming the first manager in the history of the premier league to win 3 consecutive Manager of the Month awards (October, November, and December).